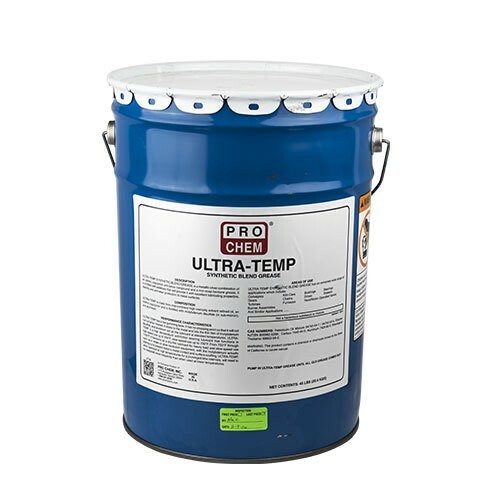 Ultra-Temp | Pro Chem, Inc.
ULTRA-TEMP synthetic blend grease is a metallic silver combination of an olefinic copolymer antiseize compound and a non-soap bentone grease. It is fortified with additives that will provide it with excellent lubricating properties, stability and antiwear protection to metal surfaces. This grease is made from mid-continent, high viscosity solvent refined oil, an olefinic copolymer and is fortified with molybdenum disulfide (in submicron) and aluminum. It has a low gumming base and no dropping point so that it will not run out when heated. ULTRA-TEMP is a high temperature anti-friction bearing lubricant that functions in high speed use up to 450°F, slow-speed use up to 750°F. From 750°F through 1100°F it functions as a dry-film lubricant for heavy load and slow-speed use, such as in slides or slow-revolution equipment, with the molybdenum preventing metal-to-metal contact and surface scuffing. When operated at high temperatures for prolonged time intervals, it will need to be reapplied more frequently than when used at lower temperatures. This product is appropriate for use as a lubricant with no food contact in official establishments operating under the Federal meat, poultry, shell egg grading, and egg products inspection programs. This compound may be used on equipment where there is no possible contact between edible products and lubricants or lubricated parts.